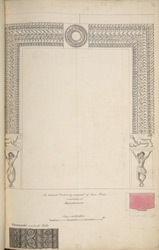 Pen and ink and watercolour drawing of a stone gateway at Vijayanagar in Karnataka, taken from an Album of 56 sheets of drawings mainly of miscellaneous architecture and sculpture in the Deccan and S. India, dated 1793-1806, from the MacKenzie Collection. This drawing depicts an elaborately carved doorway decorated with scrollwork along the jambs. Vijayanagara, the City of Victory, was the seat of a powerful Hindu kingdom in Southern India from 1336 to 1565. The kingdom was founded by two brothers, Harihara and Bukka, formerly chieftains with the Delhi Sultanate. Vijayanagara flourished as a prosperous centre of Hindu art, culture and architecture, until the Battle of Talikota in 1565 when it was defeated by the armies of a coalition of neighbouring Muslim kingdoms, its rivals for supremacy in the Deccan. The ruins of this vast royal city on the bank of the Tungabhadra River lie surrounded by granite hills. The site is also known as Hampi, together with a small local village nearby. In its heyday, with its strategic setting which was both spectacular and with good natural defences, the city was an influential centre for trade, especially in Arab horses and spices, and welcomed foreign travellers who left accounts of its grandeur. Its plan consisted of a number of zones, the sacred, the urban and the royal.